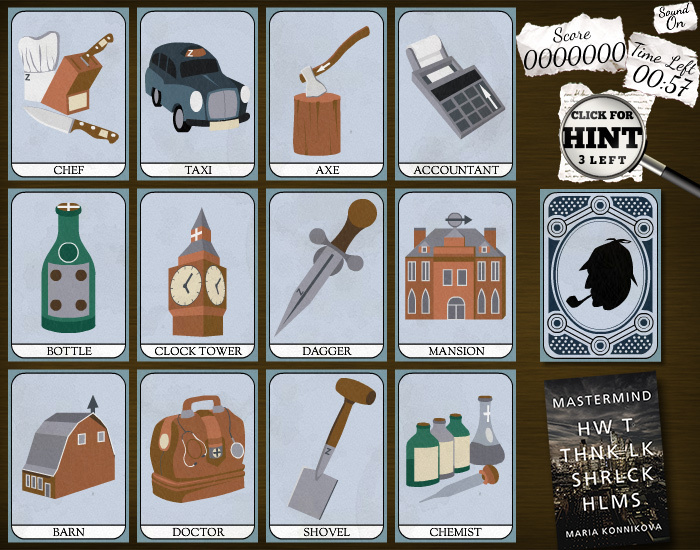 We created this Flash game for Edinburgh based publisher Canongate Books to help promote the book ‘Mastermind:How To Think Like Sherlock Holmes’ by Maria Konnikova. Do you have the brains to be a super sleuth? Test your mental prowess, and sharpen your observation and memory skills. Identify symbols or letters within the card illustrations that match across a group of 4 cards within the grid. Clear the grid within the time limit to move onto the next. The quicker you are, the more points you score. This one was especially challenging, in terms of coming up with a workable, original concept that at least touches on some of the concepts discussed in the book, but most importantly works well as a game. Mindful of the fairly limited budget, we decided early on to focus on doing something fairly simple and addictive well, rather than spreading the budget too thin. After having read the book, we decided to focus on the acts of observation, memory and filtering out of irrelevant information (some of the topics discussed in depth in the book). With that in mind we produced the final game concept. A 4×3 grid of tarot style cards would show illustrations, each containing variations of symbols and letters within them. The object of the game being to clear each grid by matching groups of 4 cards, that all contain a common symbol or letter, within a time limit. As the game progresses, more and more irrelevant noise (symbols that don’t match across a full group of 4 cards) would be introduced. To get better at the game not only does the player have to remember where the different symbols occurred within each illustration, they need to learn to disregard the irrelevant symbols that don’t match and concentrate on just the relevant (matching symbols). The player scores for each group matched and receives a bonus on completing each grid, based on how much time is left, so speed is the key to scoring well. With the final concept agreed and signed off, we went to work on producing the game. The visuals were produced to tie in with Sherlock Holmes, but with a slightly more modern feel to fit in with the book jacket artwork.